Brand Focus: Diane von Furstenberg – her story and her clothes! 40+ Style » How to dress like your icon • Style • What to buy » Brand Focus: Diane von Furstenberg – her story and her clothes! Diane von Furstenberg, style icon and owner of DVF, was in Singapore this week and I had the pleasure to attend a conversation she had with Steven Colb, CEO of the Council of Fashion Designers of America (CFDA). I knew a lot of her story already as I had also just finished reading her book: The Woman I Wanted to be. It was great meeting the woman in person and she is as kind and genuine as I perceived her to be. She has an amazing story to tell; what an amazing life this woman has! Brought up in a well–to-do-family in Belgium, Diane is lucky to be introduced into a jet-set life at an early age. She meets a prince and marries him at age 24 which makes her a princess (she dropped the title later on). She moves to New York with her new husband where they quickly become the hottest ‘it’ couple. However, shortly before, Diane was very fortunate to get the opportunity to spend time in a factory in Italy for one whole year and study the process of manufacturing fabrics and designing prints. She leaves with a suitcase full of dresses that she plans to sell in New York. Her socialite status and plenty of connections lead her to a meeting with Diana Vreeland who likes these effortless and elegant dresses made of jersey and publishes an article in Vogue. With the help of a good salesman, Diane is able to get orders and start a business. The idea for the wrap dress came 2 years later and it became a phenomenon. She sold millions and by the age of 27 was a full-blown millionaire which enabled her to buy the dream home that she still has today. In the book Diane talks a lot about her personal life too. Her 2 marriages, 2 children and the many love affairs she had with other men. Clearly she is a woman of impulse which manifests itself both in her private as well as professional life. There is no doubt that Diane has achieved a lot. After selling both her businesses (clothing and makeup lines) in her 30s, she decided to make a comeback in her 50s. She kind of lost herself in her 40s, but is now back stronger than ever. And it shows! Today, Diane is a super confident woman that seems to achieve more each year. 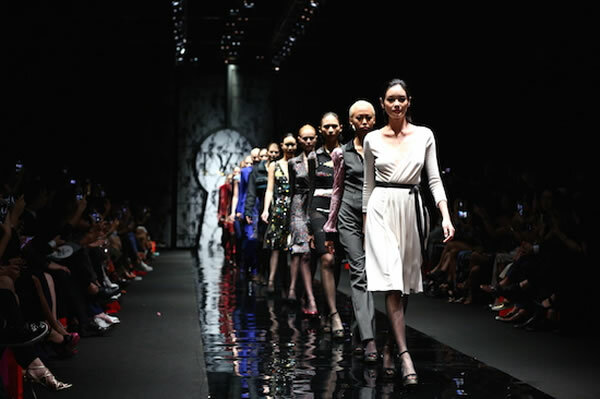 Her brand DVF has joined the ranks of top luxury international brands. She embraces her natural beautiful curls (which she describes in the book as a sign that she feels confident about herself) and is as much on the move and active as she has always been. She embraces new technology and has even joined the ranks of reality television. It seems that there is little this woman cannot accomplish. The wrap dress is still very much the core of her business as is the printed jersey fabric. The brand philosophy is simple: chic effortless fashion for a woman on the move. One of the reasons that the wrap dress continues to be popular is that it looks so good on many women. It accentuates a woman’s body at all the right places while the wraps, folds and prints can disguise growing tummies. The wrap dress looks good on women of all sizes. However, the brand now has many other fabulous designs too. Here are three of my favorites. Diane’s goal right now is to leave a legacy behind and to establish her brand as a power house that is here to stay for a long time. I think she is well on her way to doing that! If you like to find out more about Diane and read her fascinating story, her book “The woman I wanted to be” is available at Amazon. Find more items from her collection available at Nordstrom below. Do you enjoy wearing a wrap dress? I love DVF wrap dresses but have never owned one. Just returned home from a trip to New York which included shopping with friends. 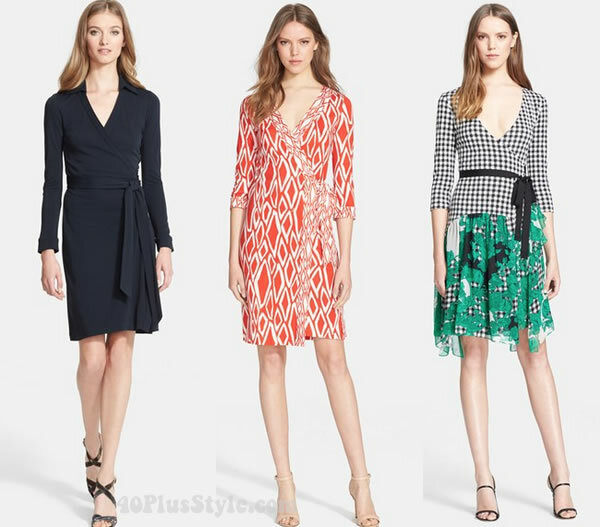 Bloomingdales had DVF items including some wrap dresses at 30% off retail. Several of the prints shown in Sylvia’s selection were available. Happy shopping! She’s a remarkable woman. Back in the seventies she sold millions of wrap dresses. Even today it’s still just as popular. What I love about the wrap dress, it fits well and very comfortable to wear. Like Charlotte Rampling, Diane von Furstenberg is a woman of a certain age who’s okay with imperfection, turning it on its head into a kind of allure. It seems to me, there’s a privilege and a power in aging gracefully. I think one of the biggest lessons we can learn from a stylish woman like Diane von Furstenberg is that the decision to forgo a youthful physical perfection takes great self-awareness and not a small amount of chutzpah. I have never liked DF wrap dresses despite this shape flatters many body types. For me they look like cheap robes, that you can wear only at home. I would have preffered the better quality and more structured fabric than thin jersey for wrap dresses. I like and wear some other items from DF collection. Thank you for the interesting information, Sylvia! I adore a good wrap dress and would love to find one of her originals in a thrift store one day. Great post and how wonderful you were able to listen to her speak first hand. I’m sure it was very inspirational. I would enjoy a wrap dress but ususally it just highlights the fact I have not got a waist. The DVF ones are usually just two inches to short for my taste. And the V-neck, although it suits me very well, shows of my wrinkles too much. Hence, I never wear a wrap dress. Shame really. I had an olive one (made by LaDress) and most people didn’t like it on me. Perhaps it was just the solid colour, I don’t know. Great article, Sylvia, and thanks for taking me along to see DvF myself and hear her talk. I love wrap dresses and would buy a lot from DvF if I could afford it.